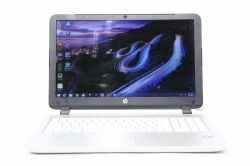 HP 15-P029NR White Laptop in excellent condition. It will deliver great value to those that need solid, portable computing power that can fit almost anywhere. This unit has a professional grade design, allowing you to get work done. There is some very light smudging, still in excellent Condition! The unit looks great and will work well for a portable desktop replacement, it's fast and very productive! Trade Up! Receive a discount for your older or non-working PC, Tablet, or other electronics. Call 707-238-5101 or visit: http://www.techassist101.com For more details! It comes with the charger and is ready to go! Please call show contact info or reply email if interested!